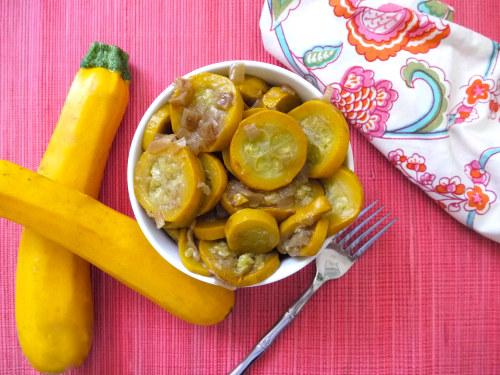 One of my favorite dishes my mother made when I was a kid was a simple sauté of lovely yellow summer squash. She would just cut the squash into little discs, cook them with some onions and within minutes we had a simple side dish that was full of flavor. To give my take on her recipe a little more oomph, I caramelize the onions first and occasionally sprinkle on a bit of Parmesan cheese to give the flavor even more richness and depth. When squash is in season, I quadruple this recipe, yes quadruple it, just so I can enjoy it as a snack during the day. It's not exactly pretzels or potato chips, but to me it's equally addictive. I was eating a bowl of it cold yesterday and Chloe was asking me for forkful after forkful until my bowl was bare. A cinch to make and straightforward delish, try making some this summer for your gang! 1. Heat the oil in a skillet over medium heat. Add the onions and sautÃ© for 5-7 minutes, or until they start to turn brown and caramelize. 2. Add the squash, salt, and a splash of water. Stir to combine, cover, and cook for 10-12 minutes for tender but crisp squash or 15 minutes for softer squash (the way I like it). 3. Let cool slightly and serve. I ate and adored this as a kid too. My southern born mom used zucchini and yellow squash together, butter, onions and lots of black pepper. It's one of my all-time favorite dishes. Yep - an old favorite! I also use zucchini and yellow squash, but my husband has a debilitating onion aversion, so I've replaced onions with julienned sweet red bell pepper strips (and/or cherry tomatoes) - so pretty, and just as yummy! Do you think this recipe would work well with patty pan squash? We got patty pan squash from our CSA and I need to use it up. Such a classic! I always loved a saute like this tossed with pasta and a ton of ricotta cheese! Can you use coconut oil instead of canola? I made this last night and half of my onions burned. Should I have added more water? Love yellow squash. Our family version is sauteed in olive oil, then once the squash softens, which takes a while, toss in a litte bit of salt, brown sugar, nutmeg and evaporated milk (whole, low fat, fat free, doesn't matter). Continue cooking until the sugar caramelizes and the milk cooks down. Yum! You should try!! This was delicious! I was having a \"what am I going to make for dinner\" moment last night, opened weelicious and saw this - and happened to have a summer squash in the fridge! My one year old ate a ton! Thanks! I sure hope my little one loves veggies as much as I do &amp; picks off my plate! Funny, I am a cold-day-after-squash eater too! I love it. also love making someting like this with zucchini. This was delicious! And easy to make! Thanks for sharing :) I will definitely be making it again.